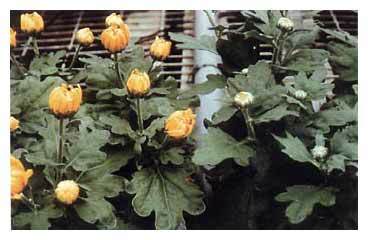 These winter-grown Chrysanthemums, all from the same batch of cuttings, have a band of pots down the center of the glasshouse with Broadleaf P4 in the compost. 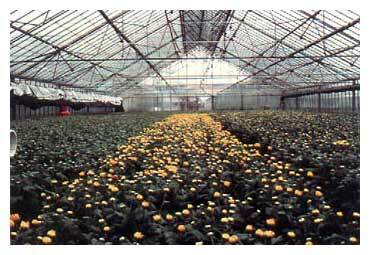 Watering and nutrition (liquid feed through drip tubes), were identical on treated and control plants but the polymer is clearly seen to have brought growth and flowering forward by 7 to 10 days. Close-up shows not only more advanced flower development of P4 treated plant (left), but more improved leaf condition, indicating a healthier, more saleable crop.